I can’t tell you how often I hear people shunning really fantastic foods because they think those foods are completely off-limits . . . and off the table. Thanks to any number of crash diets and faddish weight-loss schemes, super-healthy foods like avocados, peanut butter, bananas, and even carrots (yes, carrots!) have gotten a bad rap without good warrant. Here are some so-called “forbidden” nutrient-packed foods that should definitely be making an appearance in your diet. 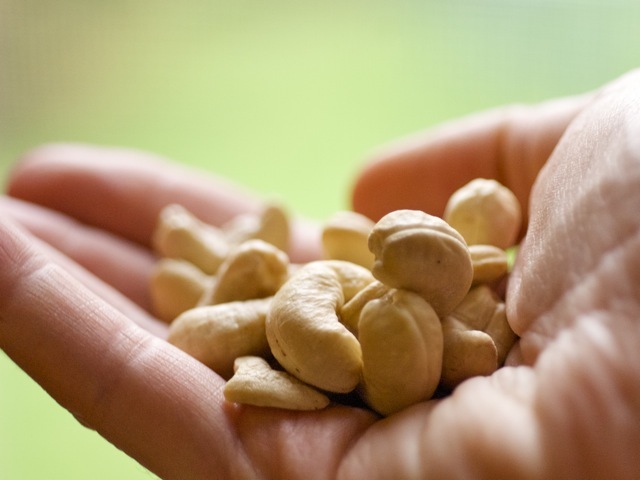 Why: Because they’re delicious and provide you with a rock-solid dose of cholesterol-lowering good monounsaturated fats, disease-fighting antioxidants, and filling protein and fiber. Walnuts in particular are packed with heart-healthy omega-3 fats. Studies show that nuts can aid weight loss and healthy weight maintenance — their good fats and fiber boost appetite suppression and satiety, which means you’ll be less hungry over the course of a day, ultimately consuming fewer calories. When: Grab a small handful or two as a satisfying snack, toss them into salads and side dishes, or sprinkle them over cereal, oatmeal, and yogurt. How much: A little goes a long way. Aim for one handful per serving (about 20 for most nuts, 50 for pistachios) or 2 tablespoons of diced, sliced, or slivered nuts. A standard serving of almonds (23 to be exact) has 143 calories, 14 grams of fat, 1 gram of saturated fat, 3 grams of fiber, and 6 grams of protein. What: Scrumptiously good, you can’t beat creamy or crunchy peanut butter (or almond, cashew, or any nut butter of your choice — just be sure you’re not downing it by the spoonful directly from the jar!). Look for a natural or organic brand to avoid unhealthy trans fats and excess sugar. Why: Yet another excellent source of monounsaturated fats to help lower cholesterol and cardiovascular-disease risk, boost satiety, and provide quick energy. When: Great on whole-grain toast or with a sliced banana for a light breakfast or snack that will keep you full for hours. Also try stirring it into Asian marinades and dressings; spreading it on whole-grain bread with all-natural jam for a grab-'n'-go PBJ lunch; smear it on a square or two of dark chocolate or graham-cracker squares for an indulgently healthy treat; or stir it into smoothies, oatmeal, and soups. How much: Two tablespoons is the standard serving: 190 calories, 16 grams of fat, 2.5 grams of saturated fat, 2.5 grams of fiber, and 8 grams of protein. What: Who doesn’t love digging into a bowl of creamy guacamole? A member of the fruit family, avocados are deliciously sinful green goodness brought to you directly by Mother Earth herself. They’re a calorie-dense source of great fats that will liven up the taste and mouthfeel of any meal or snack, even with a small amount (a little goes a long way with avocados). Why: Avocados are rich in heart-healthy mono- and polyunsaturated fats and contain lutein, a type of antioxidant that may help maintain eye health. When: Whenever you can sneak ‘em in — they’re so damn tasty! Pop a few thin slices or spread mashed avocado onto a sandwich in place of cheese and drop your saturated fat to help lower cholesterol levels. Dip fresh veggies or whole-grain tortilla chips in a serving of guacamole. Top grilled chicken, fish, or shrimp with guacamole for a flavorful boost of good fats. Or work guac or avocado slices along with some salsa into your favorite morning omelet or egg scramble. How much: One-fifth of an avocado (about 2 to 3 thin slices) is just 50 calories and 4.5 grams of fat (and only 0.5 grams of saturated fat!). What: Egg yolks got a bad “cholesterol-spiking” rap for far too long. In fact, eggs don’t affect our cholesterol — saturated fats do — and they are a fantastic, budget-conscious source of complete protein. Why: Aside from packing six grams of protein and just five grams of fat into a single large egg, they’re also crammed with nearly every essential vitamin and mineral. Eggs also contain choline, a nutrient known to enhance cognitive function, and luetin and zeaxanthin, antioxidants that may protect against age-related macular degeneration (AMD). When: The American Heart Association amended its recommendation on weekly consumption of egg yolks, so feel free to incorporate them whenever it’s convenient. Eggs are great for a quick, easy meal: scrambled, poached, soft-boiled, fried with just a dab of butter or olive oil, shirred, or whisked into a omelet, you really can’t go wrong. Hard-boiled eggs are one of my own go-to snacks to grab when I’m running around town or right after an intense workout when I’m looking for a satisfying dose of lean protein to fill me and my muscles up fast. How much: One large egg has 75 calories, 5 grams of fat, 1.5 grams of saturated fat, and 6 grams of protein. What: Yes, you CAN enjoy baby carrots and bananas again without feeling guilty. If it’s grown on this earth naturally, you can eat it with confidence, even if the sugar content in certain fruits and vegetables is slightly higher than others. Natural sugars are a great source for a quick energy boost or to satisfy a sweet tooth (more healthfully, at least, than a bag of gummy bears or Twizzlers). Why: The produce mentioned here pack in fiber, antioxidants, folate, and a host of vitamins and minerals. When: Whenever! Cut banana slices into your morning cereal or oatmeal, toss them into a fruit and yogurt smoothie, or bake them into a light muffin, cookie, or bread recipe. Munch on carrots with hummus for an energizing afternoon snack. Grab mango or pineapple chunks for a light dessert or sweet snack, or even dice them up into a simple, vibrant salsa with red onion, cilantro, and lime juice to pair with grilled chicken, beef, tofu, or fish. How much: Per serving (1 medium banana; 1 cup sliced mango or pineapple; 1 cup carrots/about 20 baby carrots).